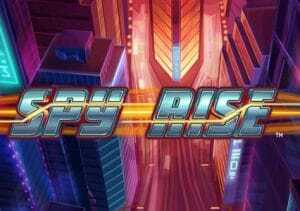 Spy Rise is a futuristic-looking espionage-themed video slot from Playtech. It’s a 5 reel, 40 payline game that allows you to up your stakes and upgrade the value of the 4 highest paying symbols. There’s also a free spins round with win both ways payouts and a chance to land a progressive jackpot prize. Play on your PC, tablet or mobile from between 20p and £300 per spin. There’s also a wild that can hit on all 5 reels. This too delivers payouts of 3.75, 7.5 or 50 times your stake. One of the main elements of Spy Rise is the ability to upgrade the value of the 4 top paying symbols via the Feature Bet Mode feature. If playing at stakes of £1 per spin, you’d have to pay £1.50 to upgrade the watch. Upgrading the watch and car costs £2 per spin with the watch, car and female agent booster costing £2.50. For the full 4-symbol upgrade including the male spy costs £3. In return for the higher stakes, the prizes on offer increase. As we’ve already stated, a combination made up of 5 male agents delivers a payouts of 50 times your bet. With the feature bet level 4 in play, that prizes rises to 83.33 times your bet. The other main extra on offer here is the Free Games feature which is triggered by landing the scatter on reels 1, 3 and 5 on the same spin – on offer are 10 free spins. These take place on a win both ways machine so winning combinations can start from reel 5 as well as reel 1. If you have upgraded symbols in play on the triggering spin, then they’re carried through to the free spins. Spy Rise also offers a shot at landing 1 of 3 prizes in the Progressive Jackpot feature. Land 3 red reels and you’ll get a prize of 3 times your total stake. Land 4 red reels and the payout is 25 times your total stake. Land 5 red reels to trigger the progressive jackpot prize. There’s a futuristic feel to the comic book design which is decent enough without being from the top drawer. That’s true of the gameplay too. It’s all pretty solid but lacks a little of the wow factor. If you enjoy the secret agent theme, then Spy Rise is certainly worth a look. If not, there’s probably not enough here to win you round. Playtech offers much better video slots with Wonder Woman and Age of the Gods: Mighty Midas recommended.